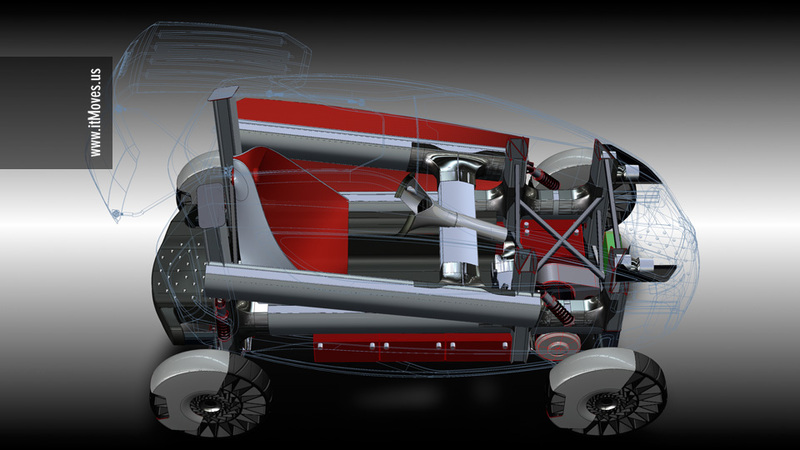 ME is a single seater, four wheel electric vehicle designed from the ground up with the car-sharing market in mind. Small enough to allow four of them to be parked in a single spot, consumers will use their mobile phones to reserve and unlock them. Once on the road, the low weight (510 kg or 1100 lb) and 10 kW AGM battery pack (easily upgradable to Li-ion) gives a 40 miles range and an estimated 80 mph (125 km/h). Not unlike a netbook relates to a laptop (offering what 80% of people needs 80% of the time), ME was created with the firm believe that overspecification, feature creep, and the need to be everything-for-everybody are a crucial impediment for the widespread adoption of electric cars. While features (in the most general sense) are generably desirable when we purchase a vehicle, we argue that the equation changes dramaticaly when only short term rental (transportation) is considered. Starting from scratch allowed us to focus on three key elements: safety, efficiency and affordability, all while keeping a contemporary design. Slightly bigger than a Smart ForTwo, the central seat and rear entry allow the driver to be further away from the impact zones that generate 95% of fatalities, providing not only a safer structure, but also unparalleled interior room. The extra space also provides a psychological sense of safety, avoiding the shoulder-against-door problem common in small automobiles. Far from being a gimmick, the rear door allows for a strong and protective spaceframe covering the most vulnerable areas in case of an accident: front and sides. Allied with the central driving position, the rear door allows ME to be a truly global product: 34% of the world's population drives on the left side (including India and Japan). The lightest, cheapest, cleanest part is the part that is NOT there. In gasoline cars, a 10% reduction in weight increases fuel economy 4.5% while a 10% reduction in power increases fuel economy only by 2.6% (study here). In other words, weight reduction is the most effective way to increase efficiency. Since batteries still compare very unfavorably with the energy-per-$$ offered by gasoline, efficiency is key to maintain battery capacity (and hence price) at a competitive level. To slap some Li-ion batteries into a conventional steel vehicle is not a good solution. 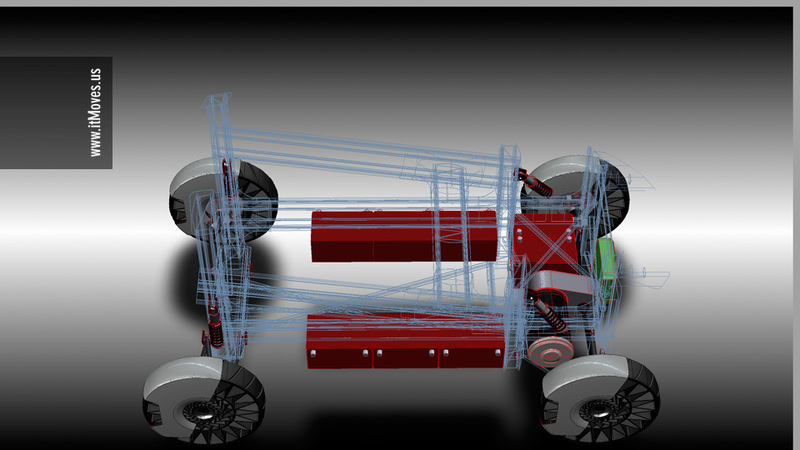 ME has a target weight of 450 kg (990 lbs), one-third the weight of a conventional car, which will dramatically improve efficiency in city traffic. The radically minimalist interior eliminates two of the most complicated assemblies in conventional cars (dashboard and seats) by concentrating all controls inside the F-1 inspired steering wheel, utilizing the driver's smartphone as the main electronic device (mp3 player, GPS, virtual key), and borrowing the idea of a hammock to produce a foldable, lightweight seating perfect for short time trips. Using a Cradle to Cradle (C2C) design approach, we have designed ME from the ground up, selecting materials and manufacturing processes that reduce materials volume, minimize waste, and improve recyclability. The vehicles are also designed for take-back and disassembly, an often forgotten but key issue for effective end-of-life recycling. For example, by tagging all the aluminum parts for easy separation, we are able to bring an economic benefit along with offsetting enough CO₂ to render the whole assembly process virtually carbon neutral. The majority of the vehicle’s components are made of aluminum, Exatec® and Tegris™, all 100% recyclable or upcyclable and offering a significant advantage over other lightweight composites (like the carbon-fiber used by Aptera, Tesla and now BMW) that can’t be recycled. While the cost of these materials is often higher, it can be made up through production efficiency and materials recovery. Substituting paint with anodized aluminum eliminates a highly energy intensive process while eliminating VOC emissions, which has health benefits for workers, customers, and the community. itMoves will reduce the impact of shipping by manufacturing in California, the expected first market. When demand becomes widespread, vehicles can be shipped in parts, ready for easy assembly at the destination. The process, known as SKD or Semi Knocked Down, enjoys the efficiencies of centralized manufacturing and provides control over component quality, while still allowing for a 60% reduction in shipping volume. At itMoves we are firm believers in the power of Elegant Design, a sublime combination of engineering and style that allows a simple, beautiful, and efficient execution of the product, enabling differentiation in the market place and a memorable user experience.